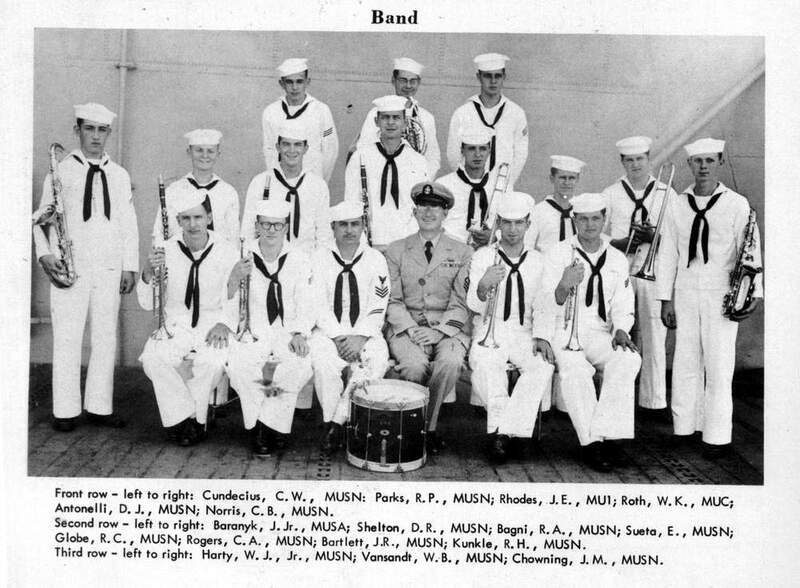 Comments: W. B. Vansandt (Nee: ) | USA | 1941-1960 | Comments: USS ANTIETAM CVA 36 1952- 1953 The USS Antietam Historical Cruise Band Front row – left to right: Cundecius, C. W., MUSN; Parks, R. P., MUSN; Rhodes, J. E., MU1; Roth, W. K., MUC; Antonelli, D. J., NUSN; Norris, C. B., MUSN. Second row – left to right: Baranyk, J. Jr., MUSA; Shelton, D. R., MUSN; Bagni, R. A., MUSN; Sueta, E., MUSN; Globe, R. C., MUSN; Rogers, C. A., MUSN; Barlett, J. R., MUSN; Kunkle, R. H., MUSN. Third row – left to right: Harty, W. J. Jr. MUSN; Vansandt, W. B., MUSN; Chowning, J. M., MUSN.